A-Mezz Blog - Page 7 of 7 - How to transform poorly used space into valuable square footage. 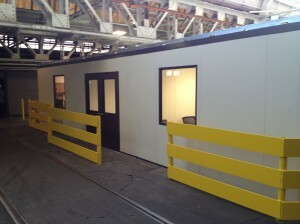 Most commonly, when someone contacts us looking for a modular building system, they’re looking to put in something small — a 12’ x 12’ office, or a 16’ x 24’ conference room, for example. That is not always the case, though. 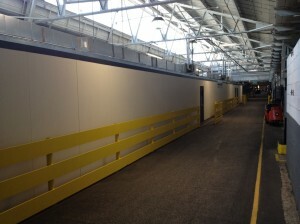 Modular wall systems are rather versatile and can be used for much larger projects as well. These photos are all of one such project we put together for a happy customer here in Cleveland, Ohio. The customer wanted to move their engineering department down onto the plant floor. Working alongside the customer, we came up with a design for a 140’ x 35’6” building system to go on the plant floor partially underneath a decommissioned bridge crane. At one end we had eight 12’ x 12’ offices, and a 12’ x 14’ three walled “war room”. The central section of the building was kept largely open to be set up for desk spaces. Typically, a corrugated roof deck is used to form a membrane that helps support the wall system. 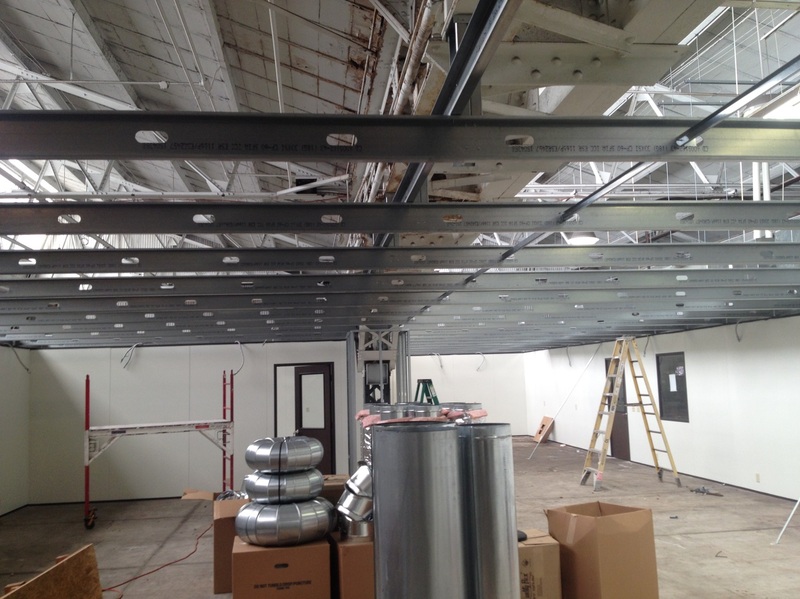 With the 62’ x 35’6” clear span across the room, we decided to support the wall panels and grid ceiling with a 4’ on center joist system that tied everything back to the support structure of the former bridge crane. The bridge crane columns were also boxed in with traditional construction to give the room a clean, finished appearance. 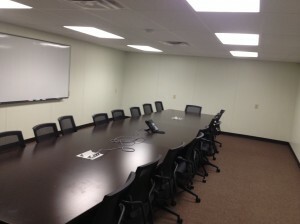 Finished and furnished 30’x18’ conference room. On the far end of the building we made a 30’ x 18’ conference room. The rest of the area was left connected to the main central region to be used for printers and supplies. Primary entrance to the finished office complex . 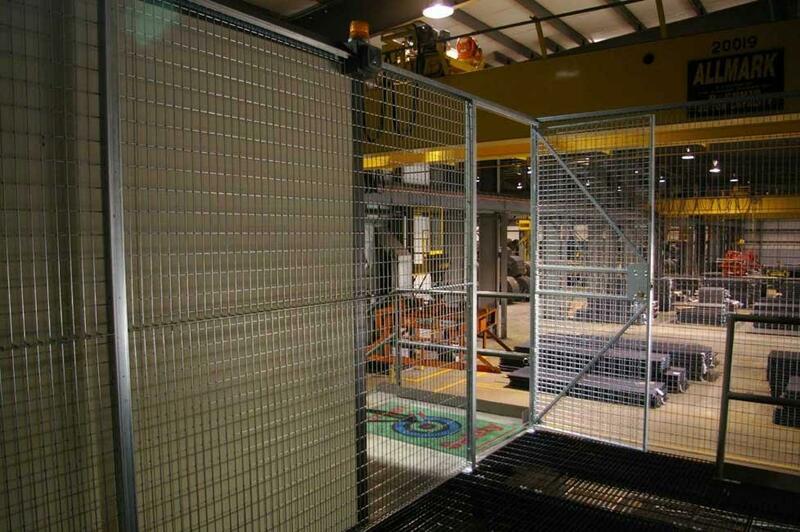 Heading into the project, one of the customer’s main concerns was to isolate their engineers from the noise of the production floor. 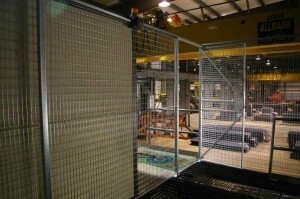 The panels of the A-Wall 200 wall system we used offer an STC rating of 32. 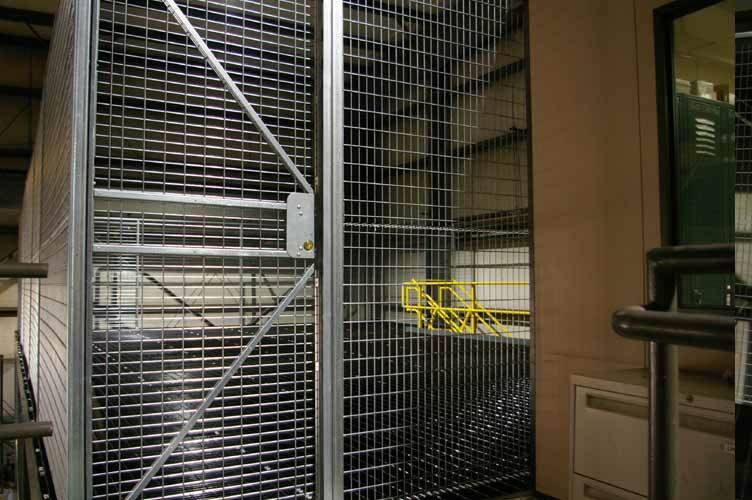 The internal tongue and groove connection between panels offers a uniform barrier of protection throughout the system. The areas where sound has an easier time of getting through on a wall system are usually the doors and windows. In order to help prevent this we put heavy-duty EPDM gaskets and mechanical sweeps on all the exterior doors, and used laminated glass for all the exterior windows. To further help isolate the building from the sounds of production around it, we placed a foam tape underneath the base track of the wall system, and added rolls of insulation above the acoustical grid ceiling. After everything was put together, we had another happy customer with a quiet engineering department located right in the center of their production floor. 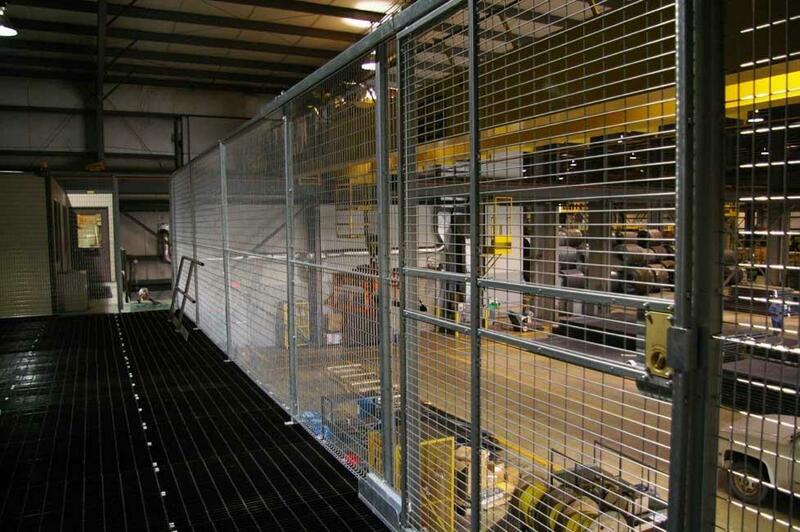 This entry was posted in modular enclosures on June 13, 2014 by Derick. 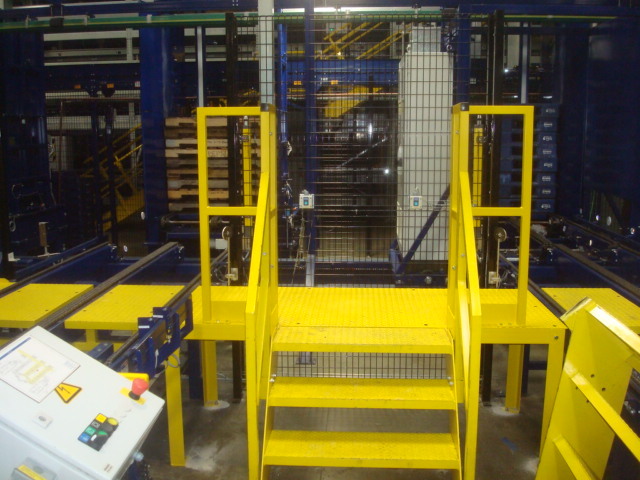 We were contacted by a customer who was looking for an easy way to circumvent a winding nest of conveyors so they would not have to serpentine around them, or worse, crawl over/under them. Some customized crossover stairs were just the ticket. We had to ensure that we did not interrupt the flow of traffic on the conveyor and next to the conveyor. 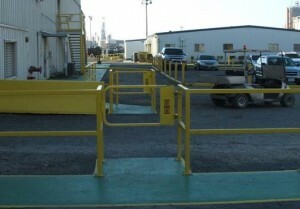 Each crossover was fitted with front steps and rear steps when travel beyond the steps was necessary to let their employees have access to all four sides of the crossovers. 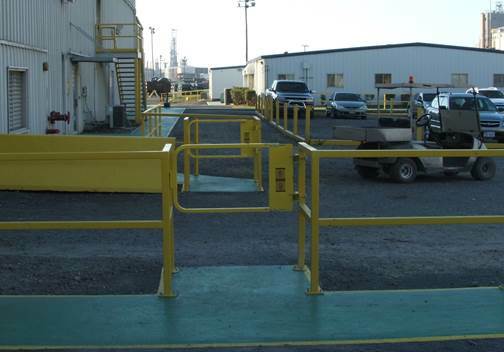 The important thing was to increase mobility throughout the plant, while not cutting off areas they already had access to. 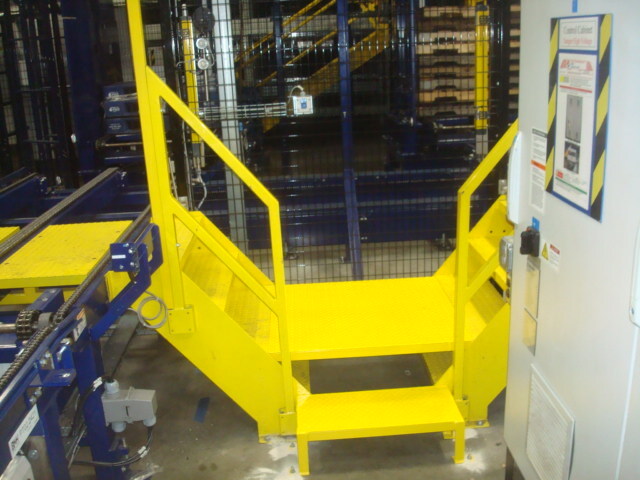 Each stair crossover was fitted with a 34” high handrail on one side and had closed diamond plate treads and decking to avoid slips and falls. Each platform was 30” high. Normally we’d just make the crossover level at the top so that you have less up and down when going across the conveyors, but the customer had some obstructions we had to work around. In the foreground of the photos below you can see that there are some control panels and electrical boxes for the conveyors that we had to keep clear. As we go higher with the mid platform we have to go longer with the stairs coming from the front and rear, which would then cause the stairs to interfere with those control panels, so the customer decided that they wanted the mid platform lower. There was also the option to go without the mid platform and the crossover stairs coming from the front and rear of it. That was actually the original design, but their employees did not like having to walk up and down and up and down over and over – especially if they were carrying something with them. The mid platform being installed at a lower height was the compromise with regards to comfort, safety and available space. 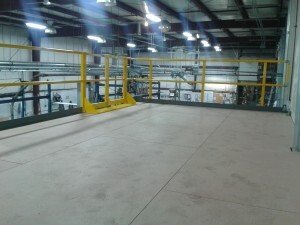 The last photo in the set shows a location where the stair crossover was actually far enough behind the conveyor control panels to do a conveyor height platform with stairs coming from the front only. 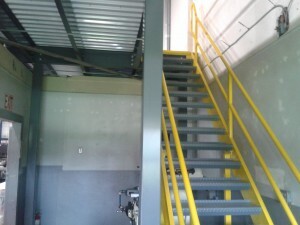 All of the crossovers were installed with the ability to be removed without too much difficulty should there be any faulty equipment that needs to be removed for repair or replacement beyond the stair. This entry was posted in stairs on June 4, 2014 by Brett. 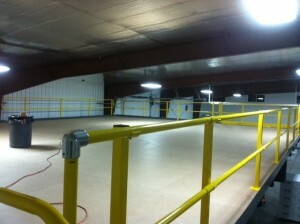 These are some photos of a mezzanine floor job we did for a site in Idaho. 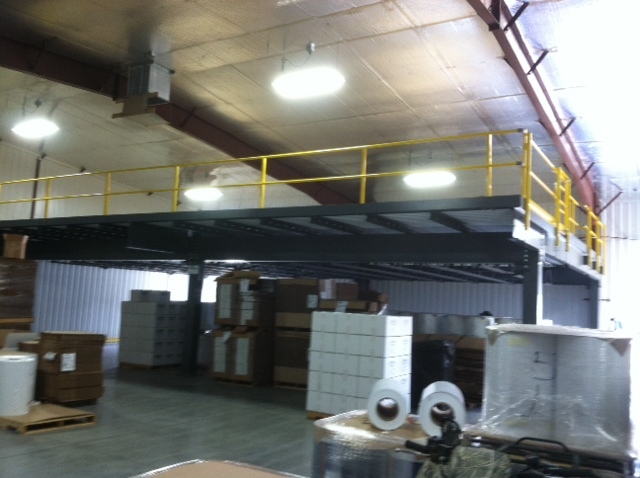 The contractor was looking to add a 50’ wide x 35’ deep mezzanine for additional pallet storage space in their client’s warehouse. 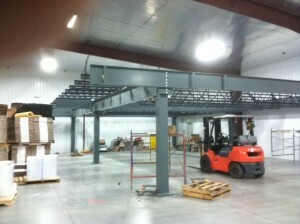 The warehouse’s cement pad was not initially setup to accommodate the loads from the mezzanine columns. The initial mezzanine design utilized beam and c-section framing with 12’6”x17’6” nominal column spans. While the warehouse had some existing reinforced concrete piers, they would have needed to install twelve additional footers in their pad to support the other columns. They provided us with a layout of their existing concrete piers, and asked us to come up with an option to help them limit the number of additional footers they would need to install as much as possible. Utilizing a beam and bar joist frame, we were able spread our column spans out to 25’ x 28’6” nominal with a 6’6” cantilevered edge. This allowed us to set four of the six columns on top of the customer’s existing reinforced concrete piers. This also had the additional benefit of allowing for a more open space below the deck. The customer had a couple options on how we could work around the large tapered building columns along the back wall. 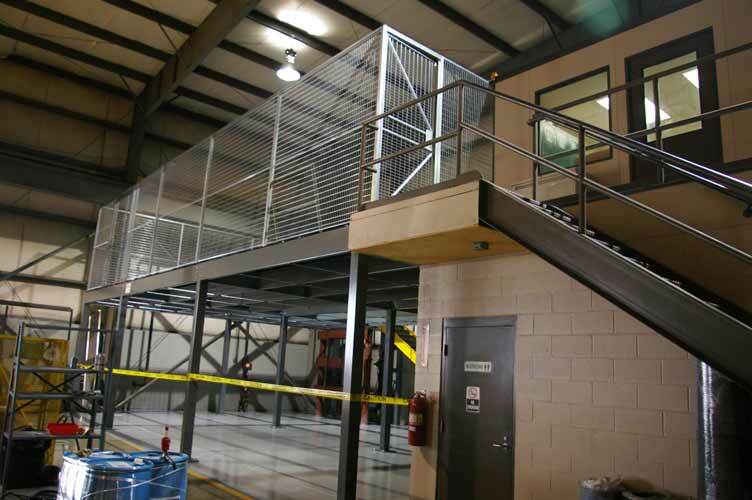 We could have dropped an additional column and used additional beams to frame around the center tapered building column, but the customer instead chose to pull the platform away from the wall just enough to clear them, and add some additional handrail along the back end of the cantilevered storage mezzanine for fall protection. 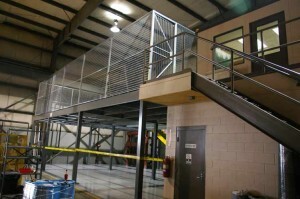 The platform was designed for a 125 pound per square foot uniform live load and used a cost effective corrugated roof deck and unfinished resindek to form the mezzanine deck. 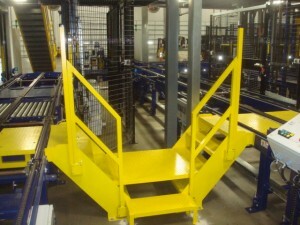 This gave the end user a smooth surface to work on that wouldn’t peel with the rolling loads of the pallet jacks, and allowed them to store their pallets of packing materials on top of the deck as long as no pallet and pallet jack weighed over 2000 lbs. This entry was posted in mezzanines on May 22, 2014 by Derick. In this photo an Ohio bearing repair shop needed a separation between a machining operation and an assembly area. 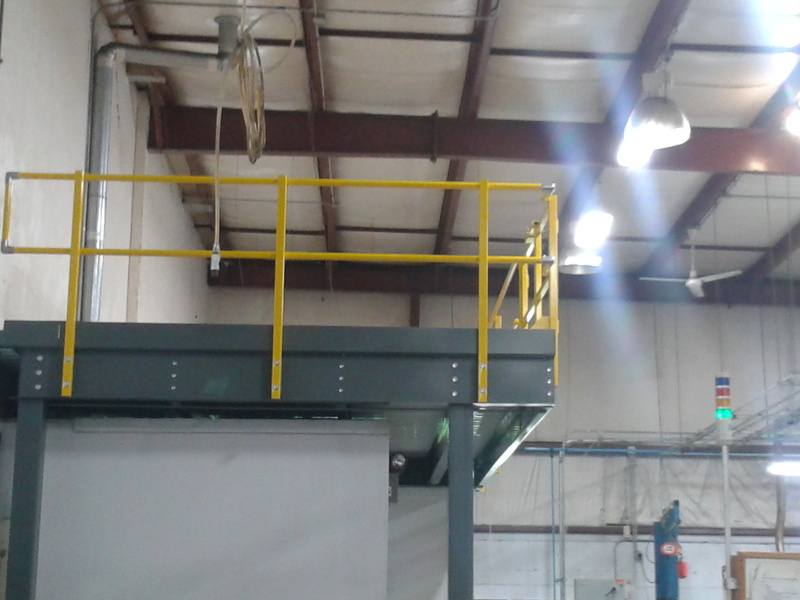 The customer wanted a portable rigid wall system that could provide flexibility and be relocated as the shop layout was most likely going to change to accommodate a new piece and an expansion to their services and equipment. The shop area was conditioned and space was already tight, so they needed to keep everything as open as possible. Windows were added for visual safety. 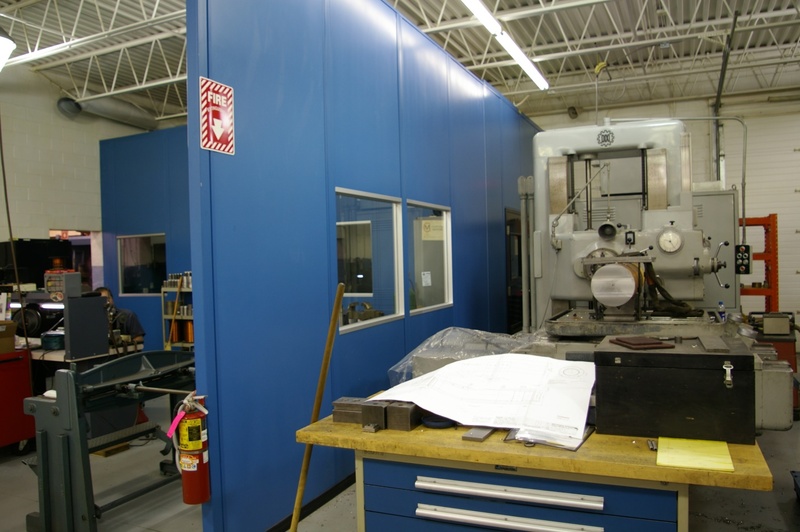 You may wonder “Why use a rigid panel and not an industrial curtain?” We offered both options and, as it turned out, the minimal cost savings of a vinyl curtain system did not negate the additional benefits of solid acoustic wall panels. Five months later the area was rearranged and these panels are being used in the new location of the customer’s shop. 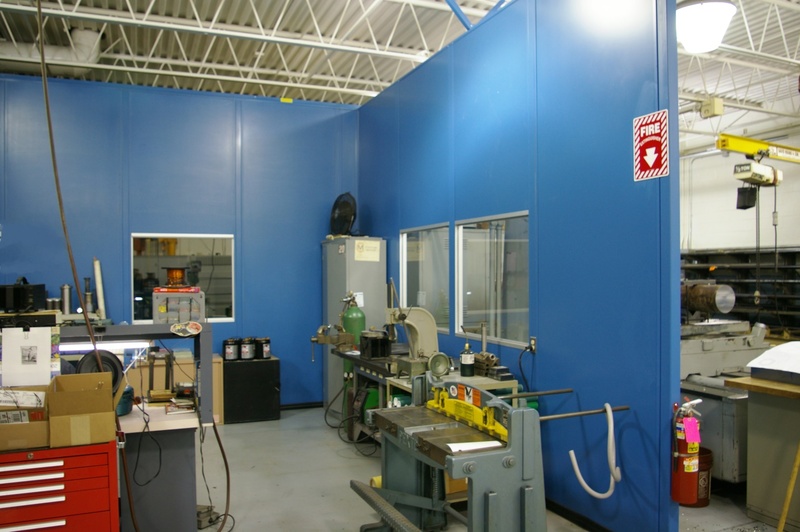 The back wall in the photo to the right shows a view of this acoustical partition system that surrounds two rather noisy compressors. 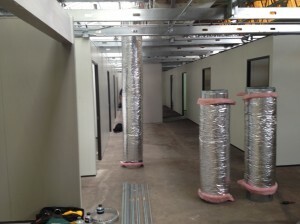 This area enclosing the air compressors does include a ceiling system with sound control insulation. All the windows are laminated tempered safety glass. Laminated glass provides superior acoustic benefits over standard tempered safety glass. When the partition curtain wall was later relocated, the panels comprising the compressor room remained in their original location. This is only one example of several modular wall systems this customer has in this facility. 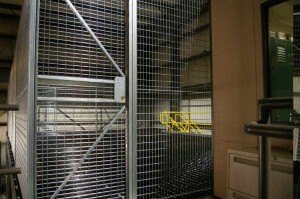 Three other modular enclosures serve as clean rooms and process control rooms, and two others are being used as production control and shop supervisors’ offices. 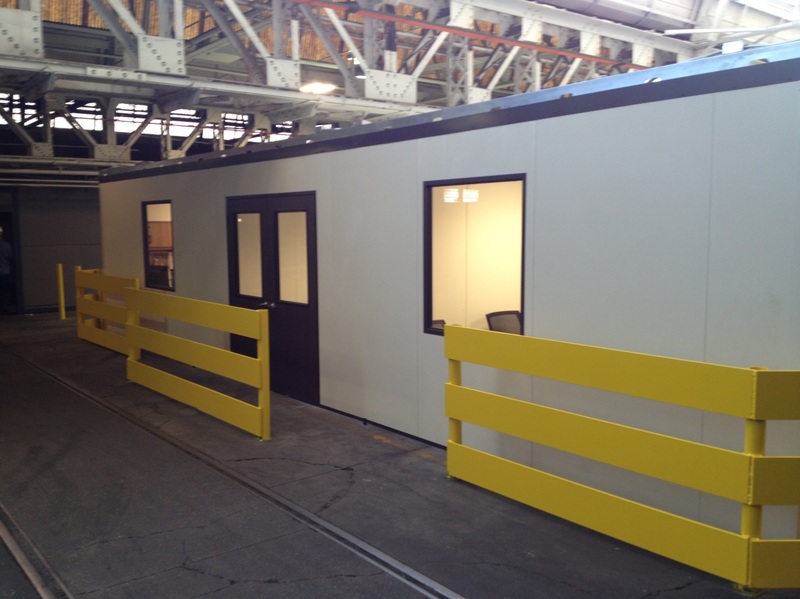 This entry was posted in acoustic control, clean rooms, modular enclosures on May 15, 2014 by Victor. 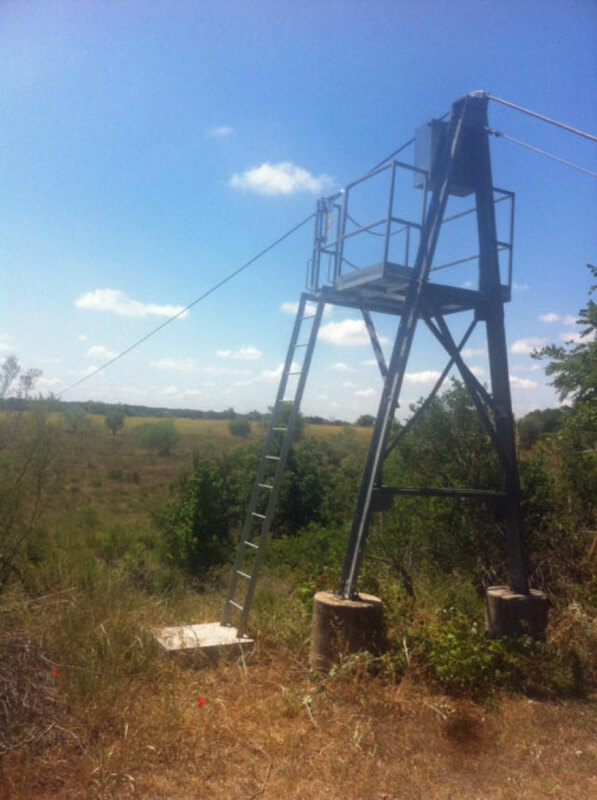 We received these photos back from a happy customer who contacted us looking for safe platform access by their ladder for a survey tower in San Antonio, Texas. They were accessing the tower shown by a fixed ladder but they did not have any fall protection at the ladder opening which is the OSHA requirement. In other words you have to have a handrail with toeboard on all sides of an elevated structure, but at the ladder opening you have two options. 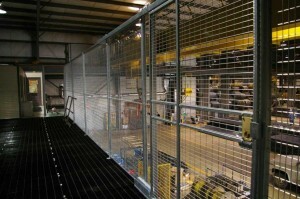 Option #1 is to use a safety gate with top and mid rail but without the 4”high toe guard. This is your most common solution. 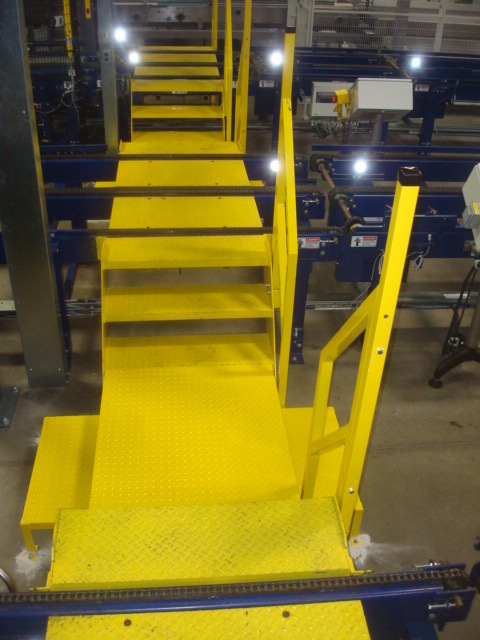 Option #2 is to have the ladder offset so that you cannot step directly into the opening. This can add much cost to a job as you have to add landing space and railing to achieve the offset install location. 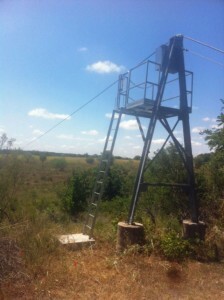 As this survey tower was not using an offset landing for the ladder, the gate was this customer’s only option available to comply with OSHA standards. 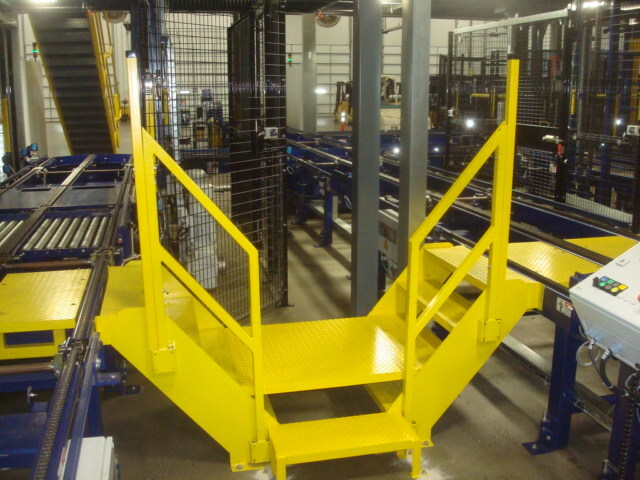 After showing them several options, they finally decided on the MLG galvanized ladder gates. For something that was going to sit out in the elements and hopefully receive no maintenance, the galvanized gate with stainless steel springs was the best fit. The MLG gate also ended up being more than 20% cheaper than their other options so they saved some money on the project as well. 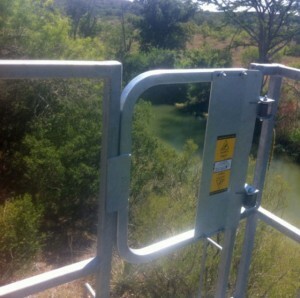 Here you can see a close-up of the ladder gate. 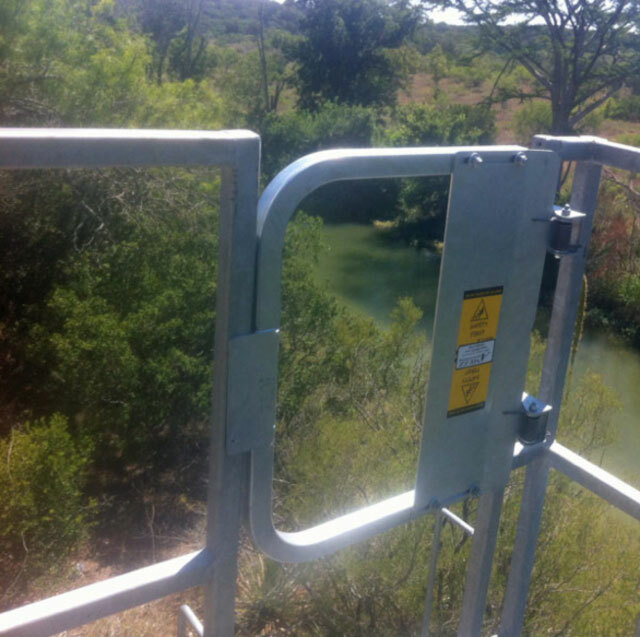 Installation was fast and simple: flip the gate around to get to the proper orientation, bolt the supplied U bolts around the existing railing, and adjust the length of the gate arm. Flipping the safety gate allows it to pull people away from the edge of the platform and into the middle. Installation took about 5 minutes from the time they unboxed the gate to completion, and now when they climb up the ladder they only have to push the gate in with their bodies and step onto the platform. No more reaching up to unhook chains – which don’t meet OSHA standards at ladder openings – or worrying about staying clear of an unguarded ladder opening. This customer was so pleased with how our ladder gates worked for their unprotected opening that they called back and ordered more safety gates for another survey tower ladder of theirs. 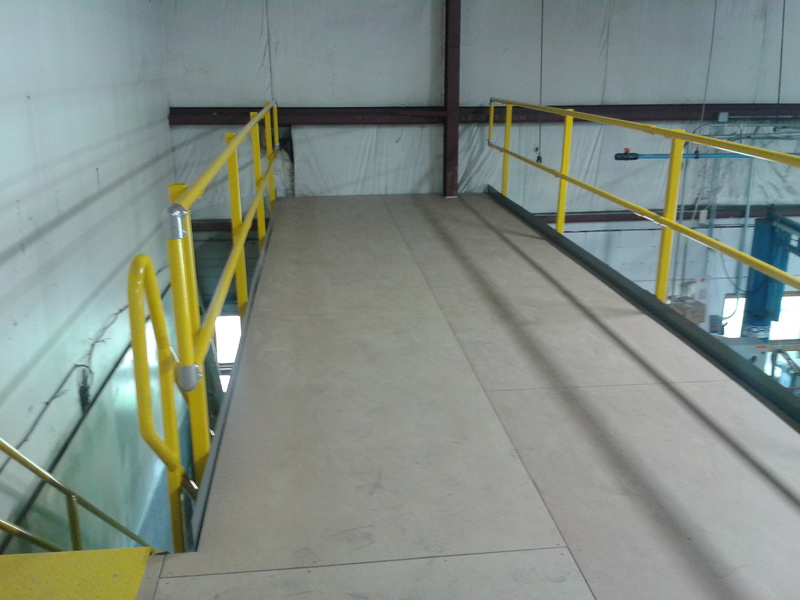 This entry was posted in ladders, Safety Gates on May 8, 2014 by Brett.